Everybody loves chocolate! But not everyone is lucky enough to receive a wonderful surprise like the one you’re just about to send to that very special person. More chocolate in one place than they’ve ever seen before, and, thanks to Godiva’s expertise, it’s of the highest quality. 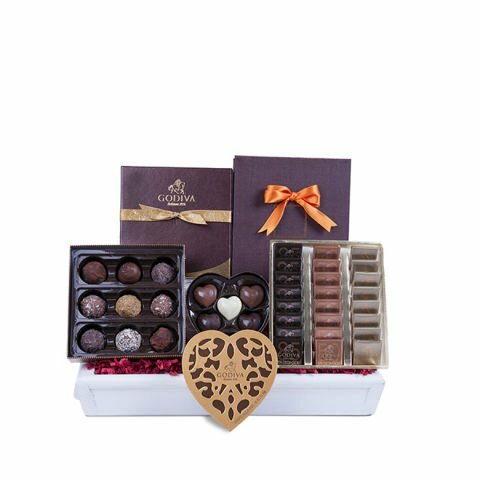 1 perfect rectangular box with 24 Godiva Carrés, three rows of delicious square chocolates that match the three textures, fillings and purity of the choice chocolates. 1 box, Godiva's Truffles Signature, with 9 truffles, a real treat that is best savoured slowly. 1 little heart-shaped Coeur Iconique box, with 6 chocolates and also by Godiva. You aim to impress and you know how. You want them to feel special, and just one box of chocolates isn’t enough. Three is far better than one, and if they’re Godiva… mission accomplished!